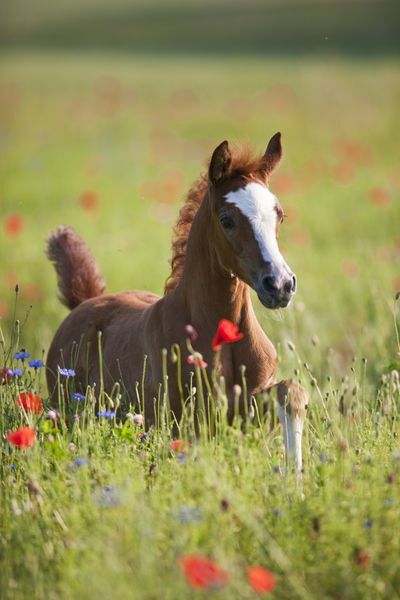 There is a lot going on in Delaware for all kinds of Equine lovers! Who is ready to get back in the saddle and ride in beautiful weather? With the winter slipping slowly behind us, the time is coming to do just that. Whether you ride the trails, compete, or just ride for pleasure, the DEC and its partners have a lot happening that you might like to take part in. We will kick off spring with our Annual Scholarship Dinner on April 6th. This year's dinner and dance will have a new twist so be sure to buy your tickets now! The DEC has also partnered with Courageous Hearts Horsemanship to present the 2nd. 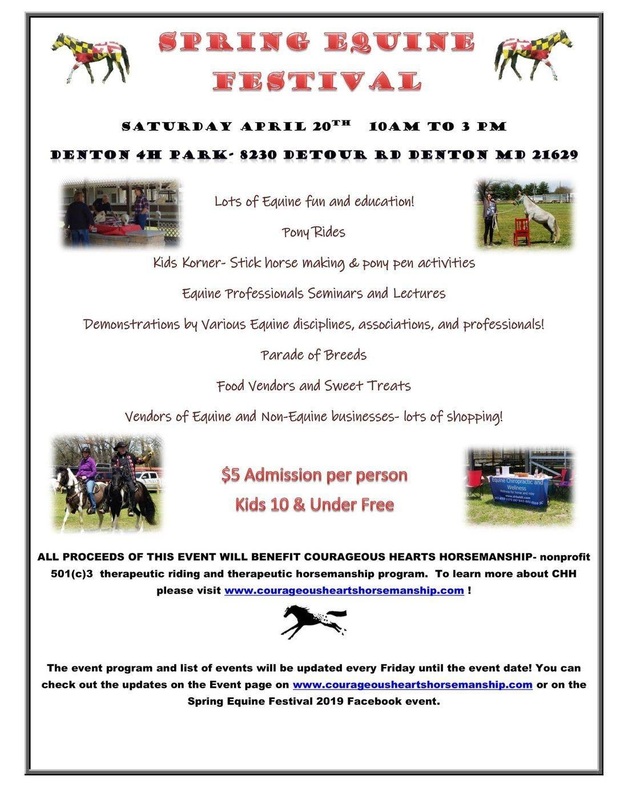 Annual Spring Equine Fest in Denton, MD on April 20th. Join us for demonstrations, seminars, and lots of kids' activities. We'll follow that with a tailgate at the very exciting Point-to-Point races in May at Winterthur. Now that's a jam-packed spring for sure! Finally, remember to get your DEC license plate! All proceeds support the work of the DEC. The Delaware Equine Council Foundation is gearing up for the 2019 Scholarship Banquet. We are still contacting potential sponsors for donations, accepting applications for grants, and planning finalizing plans for the banquet. The Foundation and Banquet Committee can use lots of help. This is a large undertaking that directly benefits the future of the Equine Community in Delaware. Please Consider Supporting it. 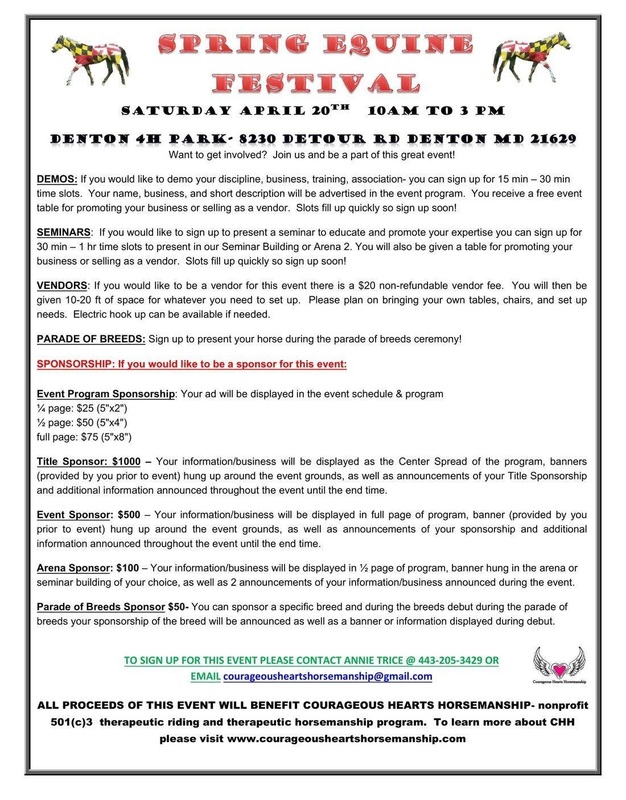 Come join the fun at the 2nd Annual Spring Equine Festival to benefit Courageous Hearts Horsemanship, a 501 (c) (3) non-profit organization, providing therapeutic riding and therapeutic horsemanship programs. This event will be held from 10am to 3pm at the Denton 4H Park located at 8230 Detour Road in Denton, Maryland. There will be lots of equine fun, demos, a parade of breeds, educational activities and seminars. Admission is $5 per person and kids 10 and under are free! Demos include "What Makes a Therapeutic Riding Horse and How Do They Help People? ", Roman Riding, Tricks to Building Trust With Your Horse, Falconry on Horseback with Paso Finos, Dressage Fundamentals, Holistic Horsemanship, Jousting and more! Come out and see for yourself and be amazed! We will have seminars such as Equine Dentistry, "Farrier Fun with Horse Shoes and Working to Fit the Needs of Horses", Horse Friendly Saddle Fitting, Equine Chiropractic Care and more! This is a great opportunity to increase your knowledge in the horse-care arena. If you would like to be in the Parade of Breeds with your horse, please contact Erin Freeman at eefreeman@yahoo.com to sign up. Provide your name, breed of horse, your horse’s name and a brief write-up about your horse for the announcer to read when you are riding your horse in the ring. All breeds are welcome. Be sure to have a valid Coggins with you. A “Kids Korner”, sponsored by J. Mills Excavating, will include, stick horse making, pony rides, face painting, Easter egg hunt and more! Vendors can secure a 10x20 outdoor space for $30 prior to the event. Payment can be made via PayPal at courageousheartshorsemanship@gmail.com or you can mail a check (payable to CHH) to CHH, 6836 E New Market-Elwood Road, Hurlock, MD 21643. All non-profit 501 (c) (3) organizations receive free vendor spots. Get on board this fun event and secure your space now. See flyer (below) for sponsorship opportunities. The DEC will be sponsoring and attending this event. Contact Annie Trice at 443-205-3429 or email at courageousheartshorsemanship@gmail.com with any questions. Hope to see you on the 20th! The Delaware Equine Council will once again host a “Tailgate” at the Point to Point steeplechase races at Winterthur. In addition, we will be volunteering in the DEC Kids’ tent in the Winterthur Hunt Market place. “Liberty” our DEC Mascot will be in attendance bringing smiles to all the children and parents alike and we will have an “I Love Liberty” Equine Council LOGO coloring table!! DEC will also have a moment of fame on the Jumbotron!!! This will advertise our Delaware Equine Council License Plate available through the DMV for your cars, trucks and trailers. A primary focus of the Council is to bring timely and educational information to the equine community in Delaware and on the Delmarva Peninsula. We will occasionally offer seminars or demonstrations that will bring issues to the equine community. We often join with Delaware Cooperative Extension or other equine organizations to best serve and make this information available. Stay tuned to this website. Check the events calendar and this page for the latest information on seminars and clinics. $35.00 event fee includes: Guided ride, lunch, live music and a 1-year Membership to DEC! After the successful 2018 “AOTB” event, this year will prove to be even more EXCITING! And Let’s PRAY for good weather!! Riders came from DE, NJ, PA, and MD proving that the Brandywine River area with the inclusion of “Granogue” the DuPont estate was a riding destination worth traveling to! Ramsey’s Farm afforded a picturesque venue for horse trailer parking, the included LUNCH and LIVE MUSIC. This year’s lunch will be from 12:30 to 3:00 with LIVE MUSIC by Kagan Nuss to coincide with the entire lunchtime. Enjoy his bluesy voice and keyboard playing as you meet and talk to fellow riders about the inspirational ride! WE STRONGLY RECOMMEND shoes or well fitting boots for your horses’ hooves (at least on the front) as some of the terrain is challenging and rocky. Guided Groups will be organized by friends and desired pace. i.e., Walk only (Leisure Pace), walk/trot (Leisure Pace), and W/T/C (Hunt Pace) based on the conditions of the day. Come join the fun on Sunday, September 29, 2019, at the beautiful Redden State Forest in Georgetown, DE. We will be hosting our 7th Member Appreciation Day Trail Ride/Drive beginning at 10am. This event is free to members. Non-members can join any of the following available memberships: Individual $20, Organizational $25, Commercial $35 and Youth 17 and below $10. This is a great opportunity to see old friends and meet new friends. An awesome lunch is provided by Shorty’s catering. Everyone knows Shorty now as he and his wife have been catering our event since its inception six years ago. So come on out and enjoy great food and company! There are beautiful, wide trails to ride on in the forest. The long loop takes approximately 1 hour 45 minutes at a walking pace. The short loop takes approximately 1 hour 20 minutes at a walking pace. As a safety precaution, Park authorities ask that you stay on the wide trails and not venture off into the wooded areas. Delaware Equine Council apparel will be available for purchase along with other DEC items. We have some beautiful sweatshirts, cups, etc., with the new DEC logo. Hope to see you there! Support the Delaware Equine Council and sport a beautiful Equine license plate on your vehicle. These plates are available at the Delaware Department of Motor Vehicles for cars, trucks, and trailers. They can be customized as vanity plates too. There is a one-time charge of $50 for the plate. The Delaware Equine Council receives $35 for every plate sold. This money goes right back to the Delaware Equine community. On September 29, 2018, the Delaware Equine Council launched a completely rebuilt web site. Along with our recently updated Facebook page, this new site is expected to grow into the place to learn about everything equine in Delaware. We are very proud of our new home. Please look around and tell us what you think using the link below. The web site has many new features. More will be coming in the next few months. The plan is to have it become a place for everyone in the Delaware Equine Community (individuals, organizations, and commercial businesses) to connect and share ideas. The site is now much easier to navigate and, we believe, much more beautiful. It is responsive to the device you are using; it should adjust to look just as good on a computer, tablet, or phone screen. Our calendar is now open to all individuals (not just members) to list their events. Membership, event sign up, directory listings, and newsletter stories can be submitted directly through the site. You can also contact any of our board members directly with your ideas. The 2019 Equine Industry Directory has been translated into a searchable database of Equine Businesses and Organizations. Try it out! Member photo albums and contests. Get a picture of yourself or your family with your horses on the front page! Our webmaster is a DEC member and volunteer. He will continue to manage this site for the foreseeable future. He does, however, welcome your comments and would love your HELP. Please use the link below to comment on any of the recent additions, site content, bugs, functionality, etc. If you are interested in computers, graphic design, coding, or just want to learn something new and would like to get involved, please visit our volunteer page to see about areas in which you may be able to help.